Compatible with Dell Platforms and backward compatible with all older versions of HDMI compliant monitors, projectors and HDTVs. 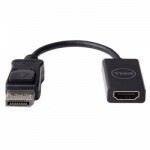 Connect your PC with DisplayPort to high resolution displays with the Dellâ„¢ Adapter - DisplayPort to HDMI 2.0 (4K). Enjoy uncompromised 4K content at 60 Hz with the adapterâ€™s seamless connection between PCs with DisplayPort and HDMI-compliant monitors, projectors, and HDTVs. With the convenience of plug & play, you can get started right away without having to install drivers.